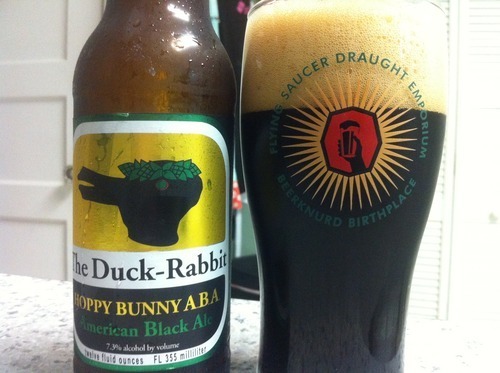 Duck-Rabbit Hoppy Bunny ABA | Drink. Blog. Repeat. American black ales – a.k.a. black IPAs – are a proliferating style in the craft beer world. While not a true style, black ales blend the dark roasted qualities of porters or stouts with the hop notes of an IPA, but with a lighter body. I’ve been a fan of ABAs since the first time I had one, but Hoppy Bunny, Duck-Rabbit’s take on the style, is probably my favorite. True to its name, Hoppy Bunny pours midnight black. There’s no light coming through the glass, even around the edges. There was a huge thick and creamy head on top that lingered. Only some light lacing, but strong alcohol legs. There’s a very pungent resinous piney hop note on the nose coupled with a strong roasted malt backbone. It’s got a very dry smell with a slight hint of coffee and dark chocolate. The mouthfeel is thick and creamy. It’s light and dry on the front of the tongue but feels lush throughout the mouth. Not nearly as dry as the nose makes it out to be. There’s that huge pine note throughout. It’s very floral and citrusy. Big coffee and chocolate notes that are very pronounced. It ends with a big hop bitterness that blends perfectly well with the malts. A very full beer, but really easy to drink. Dark beers are usually shunned because they’re “heavy” or “thick.” But with ABAs, you get the lightness of an IPA or really hoppy pale ale with the roasted malts from a porter. To me, it’s always been a great way to blend styles.